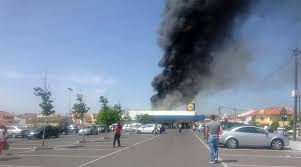 A small Swiss-registered plane has crashed near a Lidl supermarket in Tires, just west of the Portuguese capital Lisbon, killing five people. Portuguese media say the victims were the pilot, three passengers and a lorry driver, whose vehicle was hit. Three of the dead were French citizens and one Swiss, reports say. The plane had been en route to Marseille. It crashed after take-off from a local airfield. The cause is not known. Tires is about 20km (12 miles) from Lisbon. The crash site is a car park in a residential area between Lisbon and the upmarket resort of Cascais.